With Halloween falling on a Saturday this year, we knew last year we would allow the girls to have another Halloween party at our house. It’s nice to host because you know where your kids are at and it’s fun memory making. Since they’re older, I didn’t go all out. We ordered pizza, I made this dessert, and some of the girls’ friends brought different snacks and drinks to share. Crush 3/4 of the Oreos to a fine crumb; separate in two. With the remaining 1/4 of the Oreos, break into larger pieces; set aside. In a bowl, mix the cream cheese, butter, and powdered sugar together until thoroughly combined; set aside. In a stand up mixer, combine the pudding and milk (cover with a towel so you don’t have chocolate splatters on the counters, walls, and ceiling!) and beat on high for 5 minutes, stopping periodically to scrape the bottom of the bowl and the sides. Add in the creamed cheese mixture, stirring on low to incorporate. Fold in the whipped cream. Mix in half of the Oreo crumbs and larger pieces. Pour into a 9×13 pan and top with the remaining Oreo crumbs. Decorate the Milano cookies accordingly the edible gel and place throughout the pudding. Insert gummy worms into the pudding. Refrigerate for 1-2 hours before serving. 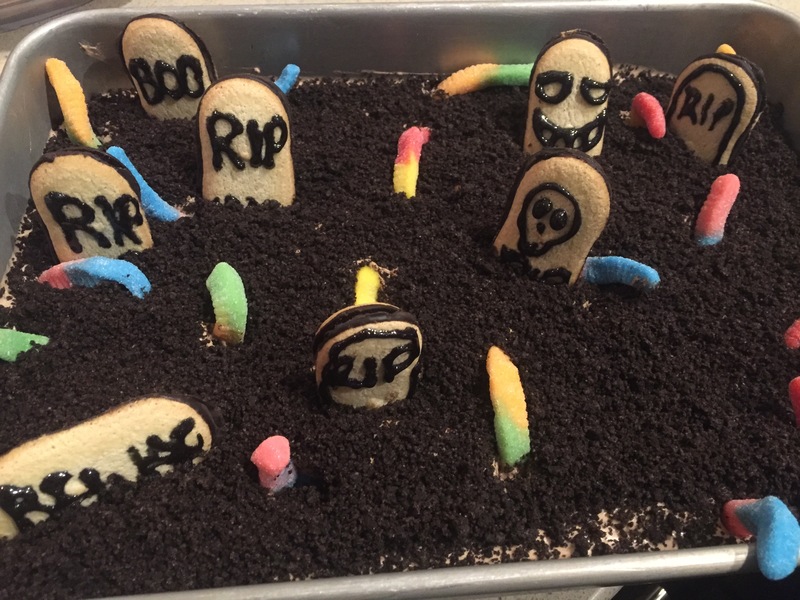 This entry was posted in Halloween, No-bake. Bookmark the permalink.